Kinetic 7 is a brand new, free-to-download gaming magazine. Issue 1 is now online for your reading pleasure. 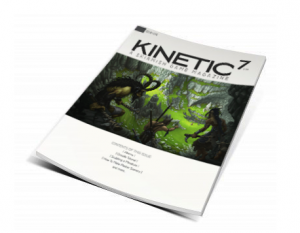 Focusing on skirmish games and the creative sides of the miniature gaming hobby, Kinetic 7 announced that their new digital download magazine launched its first issue and a new website today. The staff, based all over the world, consists of experienced gamers, miniature painters and sculptors. Claiming that "we wanted to create a magazine that we would like to read ourselves," the digital magazine is slated to come out 6 times per year. In addition to articles and guides, the magazine also promises interviews with known industry artists and personalities, tutorials and painting competitions. The premiere issue contains features of studio painters from both the Infinity line and Coolminiornot, articles about painting miniatures, and tutorials about creating scenery and sculpting. Readers will also get a closer look at the two skirmish games, Alkemy and 1650.